You’ll enjoy hosting guests in the Azalea residence (for the day or for the night), partly because everyone will be comfortable being able to retreat to the large living area, which is graced by eight large windows to let in natural light, creating a wonderfully welcoming space. The kitchen is also welcoming, whether you decide to be the chef for the evening or let the guests bring the meal. With its accommodating layout and stylish appliances, the Azalea’s kitchen makes entertaining a breeze. And, if the gathering calls for a taste of the Long Island outdoors, the large terrace or balcony just off the living area is a great place to relax and enjoy the charming campus at Fountaingate Gardens. 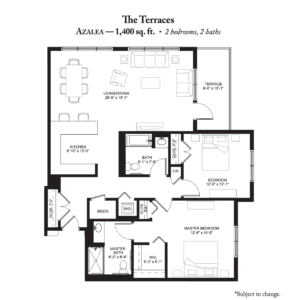 The Azalea floor plan is one of the largest available at Fountaingate Gardens, and that is reflected in the size of the bedrooms and bathrooms within the residence. Their generous size gives the Azalea residence the feeling of having two master suites, so even your overnight guests will feel at home. Within the master suite, two windows provide generous sunlight, while two closets (one walk-in) provide storage for clothes and other essentials. Just past the walk-in closet is the master bathroom, featuring modern fixtures and plenty of space to get ready for activity-rich days at Fountaingate Gardens, or beyond. The main full bathroom, which is centrally located within the Azalea home, is also appointed with modern fixtures in a comfortable space and layout. Right beside the central bathroom is the second bedroom, featuring two large windows and plenty of room for guests to stay comfortably. In the spacious Azalea residence, and in all the other versatile floor plans at Fountaingate Gardens, your living experience includes much more than just a space to make your own. Resort-style amenities and maintenance-free living make every day feel like a vacation – one that allows you to return to your own home every night. Most importantly, as part of living at a Life Plan Community* like Fountaingate Gardens, you’re afforded the stability and security of knowing that if your health needs ever change, you will receive the care you need, all on-site. Residents of Fountaingate Gardens receive the special advantage of healthcare services provided by Gurwin, the innovative, not-for-profit healthcare partner that has served New York seniors for decades. Within our community, you’ll experience a vibrant and luxurious senior living lifestyle every day, with the assurance of knowing your tomorrow is in good hands. For more information on the Azalea residence, call Fountaingate Gardens today at (631) 715-2693, or visit us online to request a personal appointment. The purpose of this marketing material is for Fountaingate Gardens to offer prospective residents an opportunity to a guaranteed priority placement in the proposed community by entering a priority reservation agreement and paying a fully refundable priority reservation fee. The priority reservation agreement is not a continuing care contract and may be cancelled at anytime by the prospective resident or their legal representative. All independent living units are to built after approval by the New York State Department of Health.